It's the school holidays and the families are out to play. 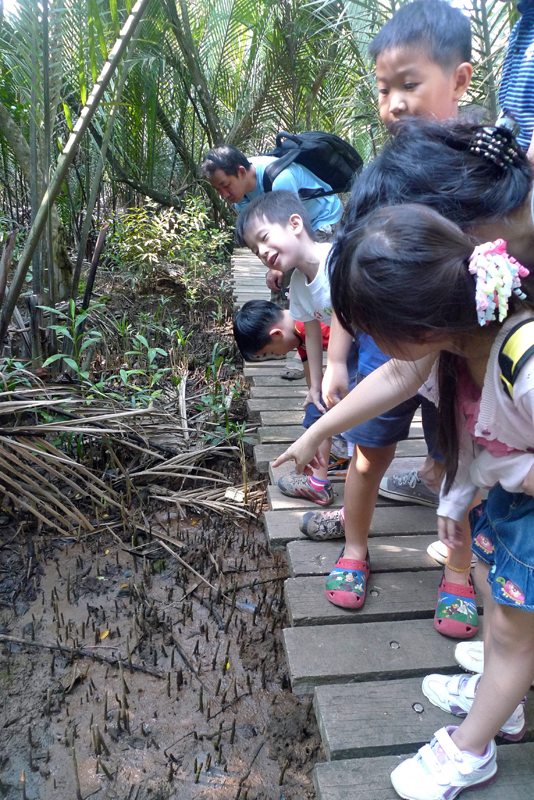 The Naked Hermit Crabs had their monthly guided walk at Chek Jawa today. We pushed the walk to the 3rd week for this month because of the school holiday season. 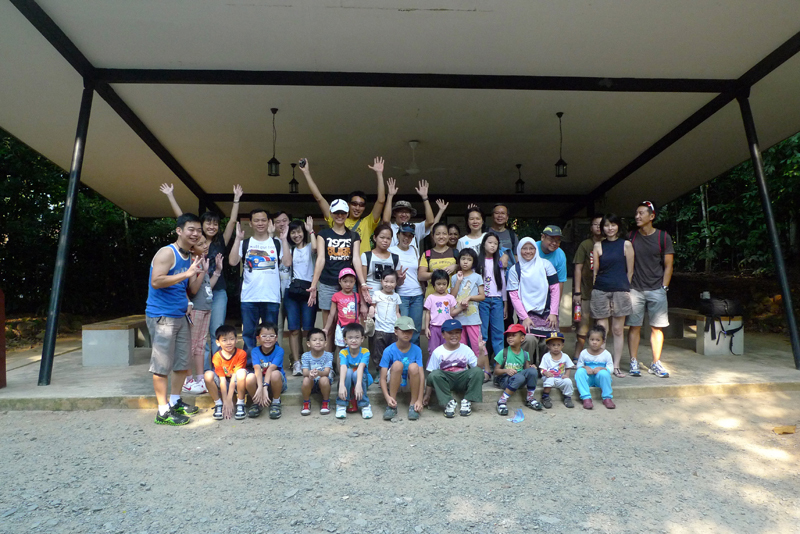 Otherwise, our guided walks for Chek Jawa is on the 2nd Saturday of each month. There were 5 guides for today's walk and we had 70 visitors with us for the walk (yes, I counted... from my photos). We took the group photo in 2 batches since the first group of visitors came early. Ria and Kok Sheng handled the first batch of visitors separately while Ivan and I took care of the 2nd batch. Ley Kun waited for late comers but there were none. 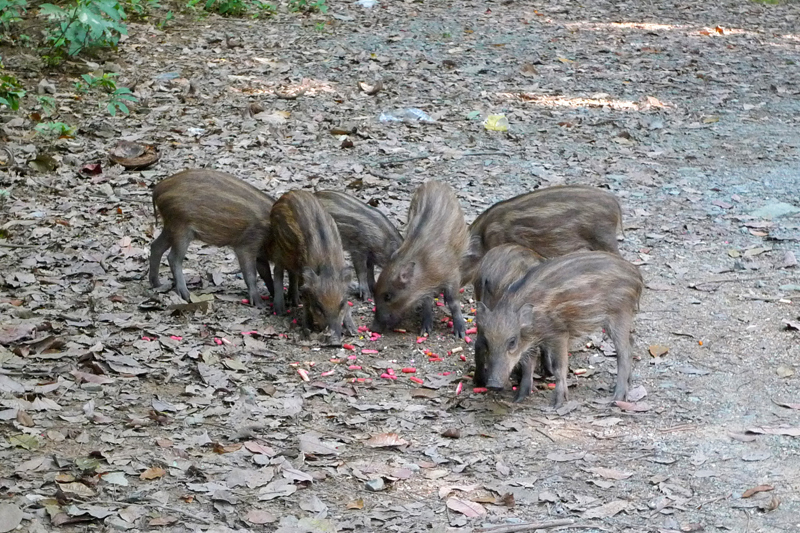 When we arrived at Chek Jawa, we were greeted by 7 wild boar piglets feeding. 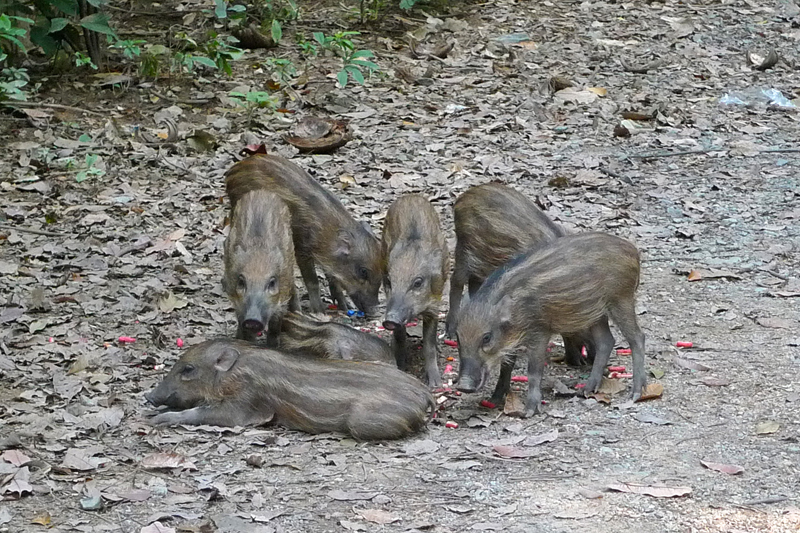 It was strange that we did not see mama pig nearby. 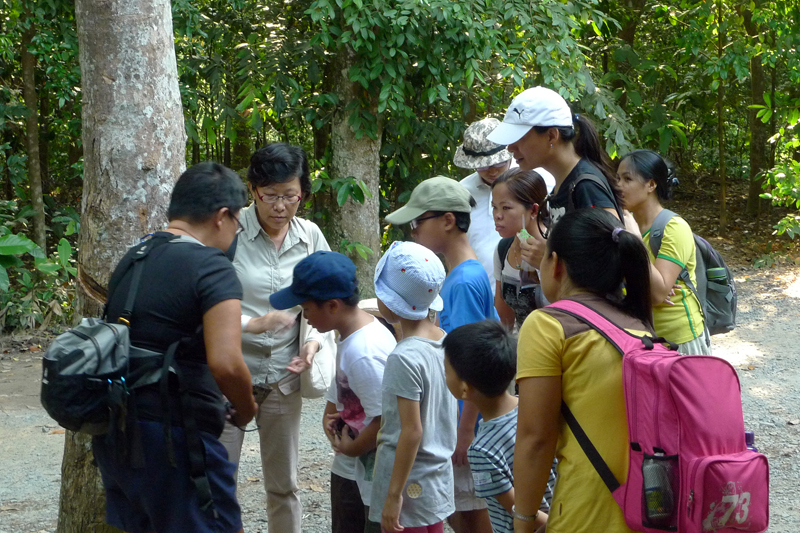 The guides also met some of our early visitors and Ley Kun shared about rubber tree and rubber tapping. One of the van drivers used to be a rubber tapper and he used come by in the early morning to give a simple tap on the rubber tree so that visitors can see the latex flowing from the tree into the collecting can. I'm not sure if that driver still do it now. Sharing about the rubber tree. 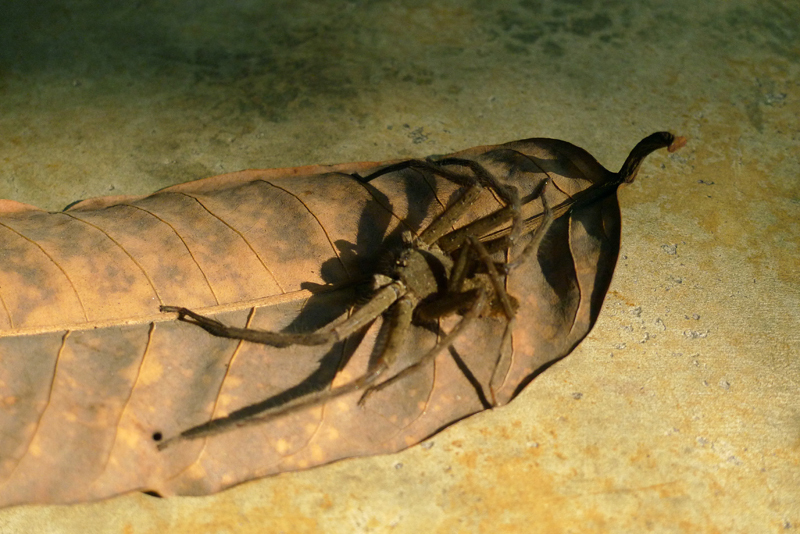 While waiting for the second batch of visitors to gather at the visitors' kiosk, Ivan found a huntsman spider (Family Sparassidae). I took a group of about 15 visitors, including 3 students from SAJC who were doing some observation on environmental engagement. The children had a very important task for my walk - they are my animal spotters. Starting on my usual route from the mangrove side, we talked about the well, the Muslim tombstones and also the fruit trees. At the start of the boardwalk, we found some tracks on the mud. I asked the children in my group who's footprint they think it belongs to. 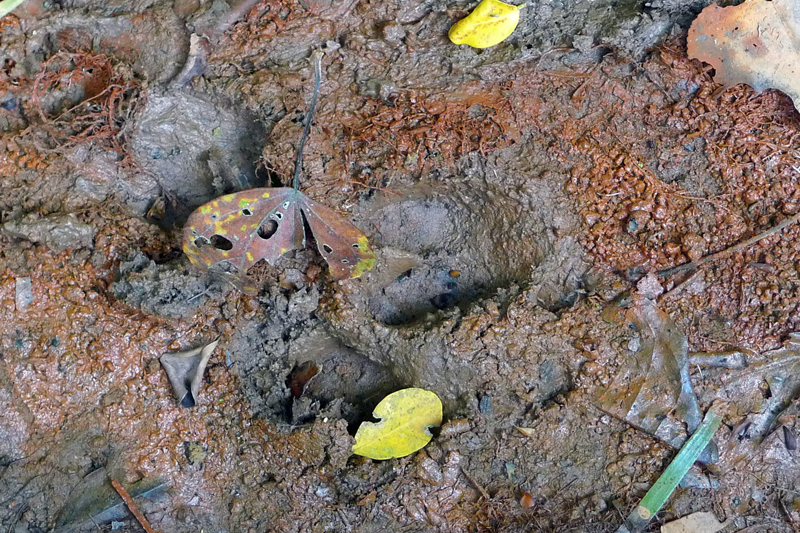 The children were able to identify the animal correctly by looking at the shape of the footprint. I developed the discussion further by asking them which direction they think the animal was walking from. Again, the children were able to answer the question correctly. I was glad that their parents also help in the thinking process. The children alerted me to the insects flying around the flower of the nipah plam. I took the opportunity to share with them how important these insects are in pollinating flowers, which allows the plant to produce fruits and/or seeds. There wasn't much activity in the mangrove. The crabs and mudskippers were not active today. We didn't get to climb the Jejawi tower as the entrance was cordoned off. However we did manage to see a mangrove crab, a few fiddler crabs and some mudskippers. 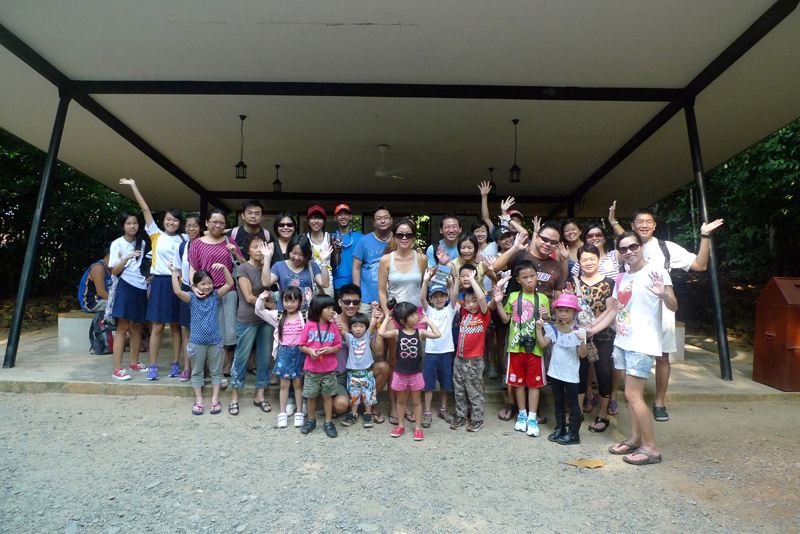 Over at Kok Sheng's group, they had a wonderful time as they saw the otters swimming, young water monitor lizard, hornbills feeding and a snake. How lucky the group is. 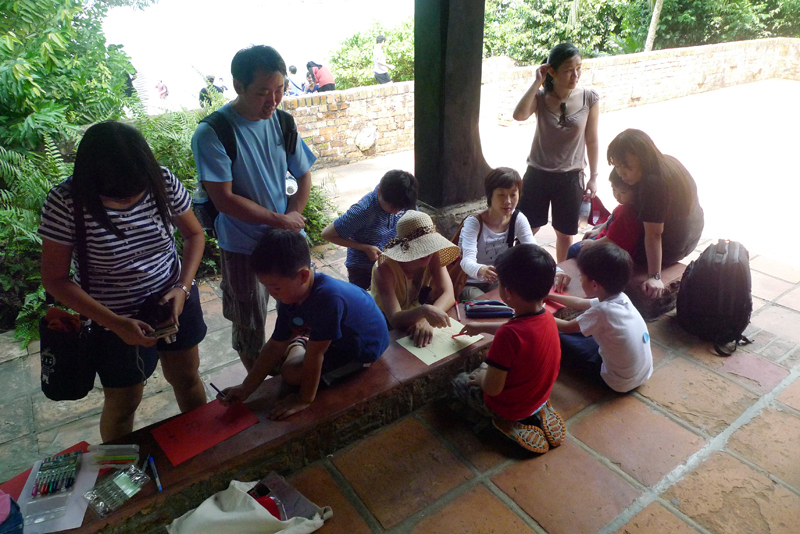 At the end of the walk, the visitors were invited to pen for the guest book. The children in my group working on their drawings. After the walk, the guides had the usual spread of food at the sisters' restaurant. 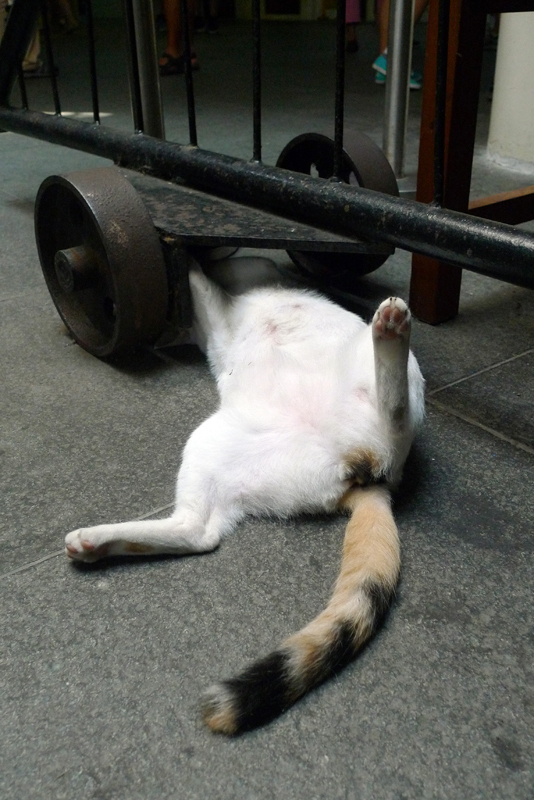 Over at the Changi Point Ferry Terminal, a cat is trying to cool down in a funny manner. It looks like repairing the wheels of the barricade. That is the cat's way of cooling off. Changi Beach comes to live!